There is something special about a donkey. It’s their naughty nature and those adorable ears. When I first went to Ballinasloe fair in 1987 the price of a donkey was 5 punts. If I had rented a big field and bought them all up I would be a donkey tycoon today! The place was flooded with them. No longer needed to pull the little orange donkey carts full of turf, people had got fed up of looking at them standing about in the field, and loaded them up into their trailers to sell at the fairs. Tragically most of them ended up on the boat to France for salami or in a truck destined for the horse abattoir to feed the lions in Dublin zoo. They then became quite scarce and it is much rarer now to see ‘the lad with the long ears’ leaning out over a gate. In the Celtic tiger years the price of a donkey reached 1000 euro. Now that common sense has been restored to Ireland they are advertised on the Done Deal trading website for between 50 and 200 euro. 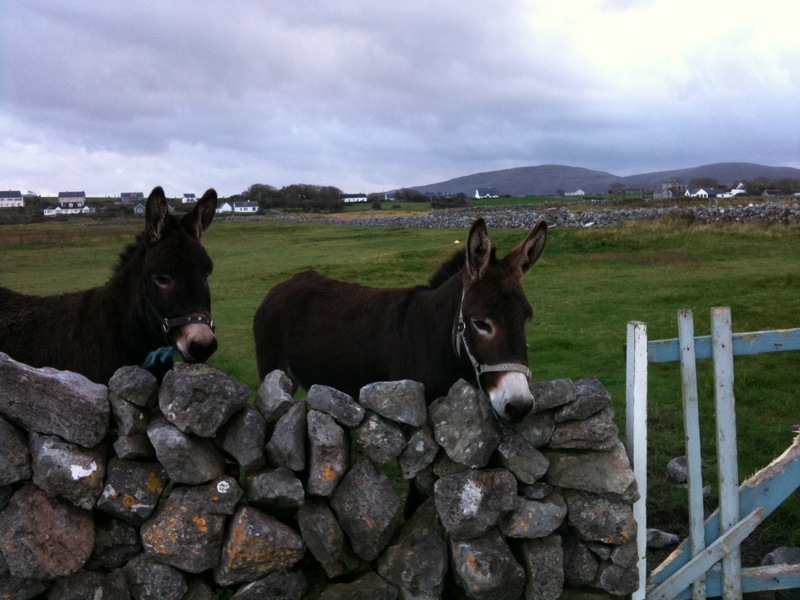 Interestingly donkeys, who seem to be a symbol of rural Ireland, were only introduced during the Napoleonic wars, around 1800, when many horses were bought up to be used in the war and replaced with donkeys imported from Spain. I met Beartlai and Finlay (above) this week and they are such characters they stole my heart. Finlay was put into his shed lately to await the farrier who was coming to trim his hooves. He managed to levitate and jump out of a small window. That is only one of his many amazing achievements! They really are charming and are meant to bring luck to a farm. I think we will have to go shopping. We have had our own fair share of luck this week with my husband securing one of those illusive Irish jobs; he will be looking after a fleet of buses in Galway city. It became available because unfortunately the Brazilian mechanic who had worked there for the last few years was unable to renew his work permit. The government has clamped down on issuing permits for non nationals. What is also good is he starts at 7.30 and will therefore avoid sitting in the famous Galway rush hour traffic for hours every day. I have been working on the young pony every day and he has stopped looking as if he is constantly under threat of attack by a mountain lion. I was very excited when he started to walk around at my shoulder, turning right and left and halting when I stop, even backing up if I walk backwards. But although he turns towards me now from the outside of the ring he refuses to approach me more than a step or two and I have to walk in towards him. So I think that is cheating a bit and I am really joining up with him rather than him with me.